Over the past few years, acoustic blues artist Rory Block has been paying tribute to many of her musical influences through her Mentor Series of recordings on Stony Plain Records. Previous albums in the series honored Son House, Mississippi Fred McDowell, Rev. Gary Davis, and Mississippi John Hurt. Block not only learned to play their music, but she also spent time interacting with each of them in a meaningful way. Block�s latest subject, Skip James, is the most enigmatic of the group. To strangers, he was solemn and often unapproachable. His music was haunting and powerful, different from the typical bluesmen of his time. When Block met James, he was in a hospital, battling the cancer that would eventually take his life, and his state of mind in that environment affected Block almost as much as his music, enabling her to better see and understand where James� music came from. Hard Luck Child includes nine of Skip James� songs, plus a Block original, the biographical �Nehemiah James,� which relates the lifelong struggle James had between gospel and the blues. That struggle often emerged in his music, and his repertoire included both styles, such as �Jesus is a Mighty Good Leader,� covered here. Songs like �I�m So Glad,� can often be interpreted as much about a spiritual relationship as a physical relationship, and with the added harmony vocals, Block�s version really brings that out. As always, her guitar work is immaculate, and she really captures the essence of James� playing style on these tracks, beautifully interpreting �Special Rider Blues,� �Cypress Grove Blues,� �Devil Got My Woman,� and �Hard Time Killing Floor Blues.� She effectively brings out the heartache and despair behind many of his best songs, both with her exquisite guitar work and her vocals. 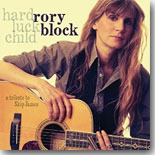 All of Rory Block�s tribute recordings have made for compelling listening, but to me, Hard Luck Child is the best of the lot. It�s just a stunning performance from beginning to end and should inspire listeners to not only explore the music of Skip James, but to go back and pick up Block�s other Mentor Series volumes as well.